Kenneth Lonergan (MARGARET) has created a masterpiece in his tragicomedy MANCHESTER BY THE SEA, showing in what is turning out be an exceptionally good year at the BFI London Film Festival for bittersweet drama. 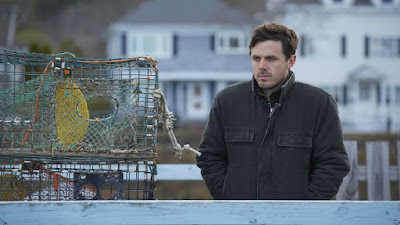 The film stars Casey Affleck as Lee Chandler - a small-town boy who fled to Boston after a personal tragedy, but is brought back when his beloved elder brother Joe (Kyle Chandler - FRIDAY NIGHT LIGHTS) dies. Joe leaves a detailed will making Lee the guardian of his teenage son Patrick (Lucas Hedges - THE SLAP) and the pair seem ideally suited. The uncle and nephew have a genuine emotional bond and shared memories, delineated in flashback. They share the same foul-mouthed sense of humour and seem to understand when the other needs space. But they are fundamentally different. Patrick is young and popular - he's on sports teams, he's in a band, he has a bunch of great friends and two girlfriends. He great good humour make the few moments when we see his grief break through all the more powerful. But Patrick's ebullience also serves as a counter-point to Lee's almost ghost-like presence and a reminder of what he might have been like before his own personal tragedy. The point of the movie - its emotional struggle - is to show whether Lee can somehow move beyond his past and become the father-figure that Patrick needs him to be. Casey Affleck has long been an actor I admire, and his quietly powerful performance here reminds me a lot of his role in THE ASSASSINATION OF JESSE JAMES BY THE COWARD ROBERT FORD. There's something enigmatic and vulnerable about his on-screen presence, even when he's on the verge of beating someone up in frustration. But the break-out performance for me was that of Lucas Hedges as Patrick - full of charisma and life but completely selling the heart-breaking breakdown. By contrast, I was a little underwhelmed by Michelle Williams as Lee's ex-wife. Her typically tremulous performance felt somehow overplayed in a movie of understated authenticity. The final point to make is that the film is beautifully shot by DP Jody Lee Lipes (MARTHA MARCY MAY MARLENE) on location in Manchester and Beverley, MA, capturing the stunning crisp light on water. I also loved the unconventional juxtaposition of this contemporary relationship drama with a formal baroque choral soundtrack that sometimes served to underpin the emotional weight of the film, and at others contributed to the absurd black comedy of the piece. The result is a film that finely balances comedy and tragedy and leaves us with memorable images and set pieces. The tone is perfectly judged, and while I was genuinely in suspense of how the film might end, once it did, I couldn't see how it could've been any other way. MANCHESTER BY THE SEA has a running time of 137 minutes and is rated R. It played Sundance, Toronto and London 2016. It opens in the USA on November 18th, in Canada on November 25th, in Italy on December 1st, in the UK on January 13th 2017, in Germany on January 19th and in Australia on January 26th.